This segment of our services includes installation of solar panels and making necessary electrical connections. We find the most appropriate space in your premises, where incident sunrays gives off maximum efficiency. Next, our experts facilitate installation of the panels whilst keeping in mind the legitimate angles and juxtapositions. Further, the panels are coupled to the electrical wiring of your building and there you are –ready to use solar energy. Coupling a solar setup to the existing house-wiring is a crucial task and takes proper planning and skills. Our experts analyze the wiring scheme of your building premises and thus deploy solar-panel wiring accordingly. We also install safety fuse and miniature circuit boards to ensure optimum safety of the customer. During chilly winters, when hot water becomes a burning necessity, you can save on your electricity bills that would have incurred due to excessive use of electric boilers by choosing solar boilers. We install solar heating appliances of different ratings and capacities commensurate to small and large commercial and residential premises. We install energy efficient lighting that is designed to give maximum efficiency when coupled with solar power generators. We can automate the lights such that they will turn on automatically at night and will turn off in the morning; thereby, leaving you with maximum peace of mind. Aussie Electrical and Solar offers an extensive range of solar services, from installing new solar units to relocating the existing ones and everything in between. You can seek our solar services for commercial, residential and industrial projects –whether installation, repair, maintenance or anything else. 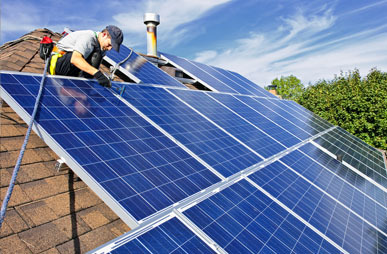 Just give us a call to have our qualified solar panel technicians at your disposal in Melbourne and surrounding areas. We always look forward to working with you. Aussie Electrical and Solar offers the following Solar Services. Use of clean and renewable energy. Reduce pollution and help the environment. Generate your own solar electricity. Sell excess electricity back to the grid network.